A significant improvement in the instrument. 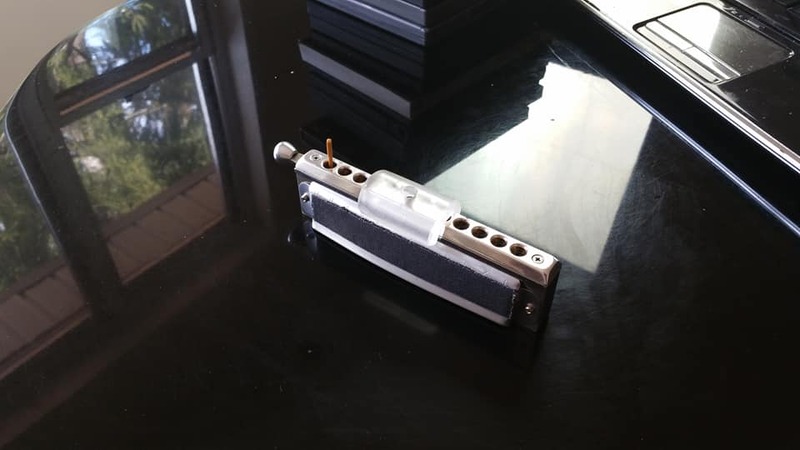 The first Kettlewell Frictionless Mouthpiece Slider approved for release to the musical world is available only on the LITTLE PUNK custom harp. The fastest playing harp on the terra. 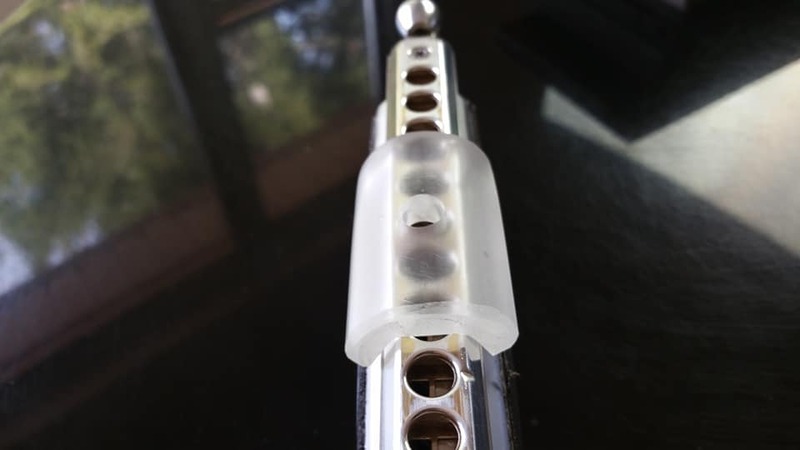 – State of the art COOL ICE 1 hole Slider…friction free movement to new note hole positions, no using saliva to lubricate-so harp stays clean. Relaxed comfortable embouchure, plays fast like wet ice. Can be played as a Kettlewell Frictionless Mouthpiece harp or as conventional…Slider requires NO harp modifications…drop on-or off. The most revolutionary concept in chromatic harmonica since the instrument’s invention. “The Kettlewell Frictionless Mouthpiece raises the chromatic harmonica for the first time to the level of a top professional orchestral instrument.” Italian composer, Andrea Antonello Nacci. These custom instruments are hand built by the inventor of the Kettlewell Frictionless Mouthpiece (and author of the book LOVE OF CHROMATIC HARMONICA…TECHNIQUES AND ADVICE FROM THE WORLD’S BEST!) David Kettlewell, on a Seydel Saxony chassis. The Slider is designed and built by hand by Mr. Kettlewell and fully meets his exacting quality standards. OTHER CUSTOMIZATIONS are available on this harp, including retuning of 12th hole (on orchestral tuning model) to E/F/F#/G from the stock E/F/F/F#- gives harp 3 full octaves, mouthpiece indexing, gold plating of mouthpiece, and other Slider hole patterns such as 5 hole and 3+1…but this is set up EXACTLY as Mr. Kettlewell plays in practice and performance. ttlewell is also experimenting with new complex curvature upper portions of the Slider, to match the shape of the lip. – The first is to reset your neuromuscular memory; as your body adjusts to the new feel and ergonomics of the Frictionless Mouthpiece. You experiment with ease of movement left and right, and landing squarely on new note hole positions. Your first two days will feel like you are attempting to play a cello. You will seek a comfort in play. This phase lasts from 3 days to a couple of weeks, and you’ll find your progress rapid, improvement is noticeable day to day. At the conclusion of this time period, you pretty much have the same skill level you had prior, but are now enjoying the ease of movement to new note hole positions, the more relaxed embouchure position, and a cleaner harp as saliva is no longer dribbling into your instrument…you play it dry. These things I fully expected with the Frictionless Mouthpiece. 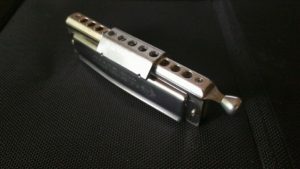 – The second learning curve is quite different from the first, and will go on for a much longer time period (years)…for you are now pushing into the world of what the conventional chromatic harmonica mouthpiece cannot do…developing NEW skills and articulations not available to you before. You learn how the clearer attack on the note (facilitated by the Frictionless Mouthpiece) affects phrasing, and you find that the improved accuracy translates into more than the clarity of one note…to an ability to craft phrases more precisely…which your listeners interpret as “more fluid phrasing.” Learning to control that precision to what you consider optimal effect is a new thing. You learn the new ease of the glissando, and your ear begins to guide you regarding what you choose to do with it. You experiment with larger intervallic leaps, and ponder what that means to how you will choose to play a given piece. Your body learns to relax more in play. Andrea suggests that the invention of the Frictionless Mouthpiece will result in more acceptance of the instrument by academia, and more composers interested in composing for chromatic harmonica…that the instrument has taken an irreversible quantum step forward to the high levels of design and performance evidenced by the flute, oboe, and clarinet. From my experience playing the Kettlewell Frictionless Mouthpiece, I can say that all the above is true…and more. I believe it will take one generation for the majority of players worldwide to utilize the Kettlewell Frictionless Mouthpiece, which is about the same time it took for the shoulder rest for violin to find full acceptance. – Historically, chromatic harmonica players tend to play notes of smaller intervallic jumps…often contiguous holes…due to the ergonomic challenges with conventional mouthpieces. This will likely no longer remain true, and that means potentially…a new voice to the instrument. – It is my impression that players new to the instrument will adapt to the Kettlewell Frictionless Mouthpiece naturally and quickly. Intermediate and Advanced players face the truth that it requires development of new body memory. Having played the Kettlewell Frictionless Mouthpiece for about a month now, I can say that the invention brings a surprising number of changes to the instrument in play. We are still exploring this area, and I am very grateful to Andrea and the many other friends who have helped me think all this through.